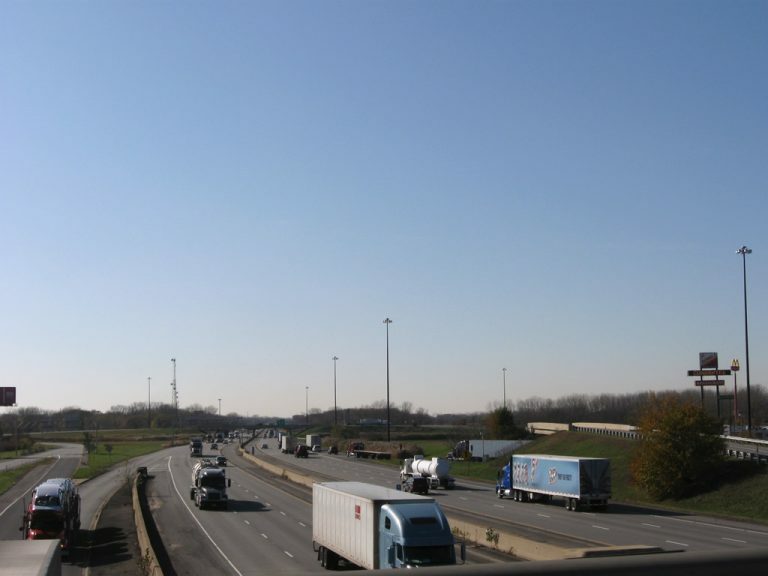 Heavy truck traffic is present at the trumpet interchange between the Frank Borman Expressway and access road to the Indiana East West Toll Road. Interstate 80 leaves an overlap with Interstate 94 to join Interstate 90 at this junction. Photo taken November 5, 2009. The 3,100-mile cross country interstate that runs from Seattle to Boston runs for 156 miles across Indiana from Hammond at the Illinois border to near Angola at the Ohio border. For its entire length, the interstate forms the Indiana Toll Road, multiplexing with Interstate 80 for the majority of its route. The interstate leaves Chicago, Illinois and enters Northwest Indiana in the Hammond area, passing through East Chicago and Gary before joining with Interstate 80. East of there it passes by Chesterton, LaPorte, South Bend, Elkhart and Angola. Side plazas collect tolls at the interchange with Interstate 65 south and U.S. 12 & 20 (Dunes Highway) in Gary. Photo taken November 5, 2009. Gary Avenue connects the Indiana East West Toll Road with Indiana 912 (Cline Avenue), a north-south freeway serving Hammond and west Gary. Gary Avenue east of Cline Avenue defaults onto Interstate 90 as it turns south along the periphery Gary/Chicago International Airport (GYY). Photo taken 11/04/11. A toll plaza collects fees for the Interstate 90 eastbound on-ramp from Gary Avenue ahead of the directional interchange with Interstate 90. Photo taken 11/04/11. 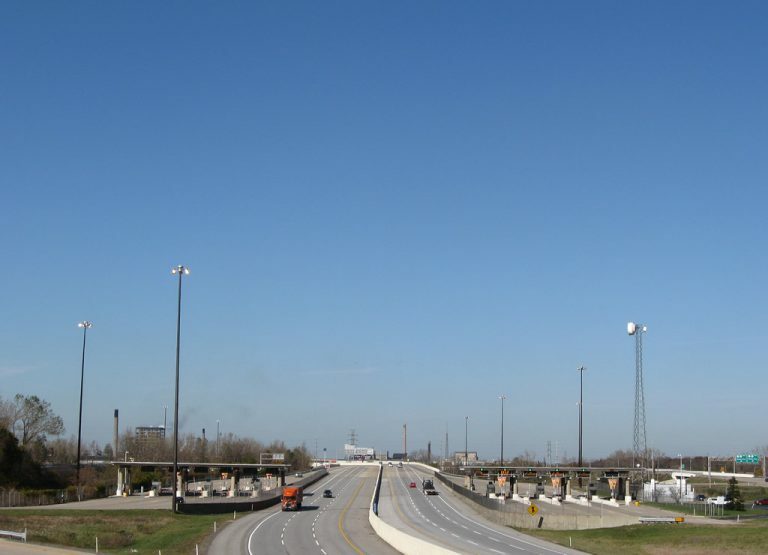 Drivers headed west to Hammond and Chicago are levied tolls at a main line plaza ahead of Exit 0 (U.S. 12-20-41) or on the ramp toll to U.S. 41 (Indianapolis Boulevard) at Exit 5. Photo taken 11/04/11. Entering the Gary Avenue toll plaza for the Indiana Toll Road, four lanes are available for Interstate 90 east through Gary to Portage and South Bend. The right lane bypasses the collection facilities otherwise. Photo taken 11/04/11. A single lane ramp passes under the Interstate 90 mainline and flyover ramp from eastbound to Gary Avenue at the Grand Calumet River. Photo taken 11/04/11. Ramps from U.S. 12 & 20 (Dunes Highway) and Interstate 65 combine ahead of a trumpet interchange to Interstate 90 east to Lake Station and west to Hammond. Tolls are only collected in the westbound direction. Photo taken 11/05/09.